Ternate, the second largest island of the North Maluku archipelago, is usually the entry point for accessing the North Maluku islands because of its larger airport but also as being the ancient capital with its long history and notably the spice trade. 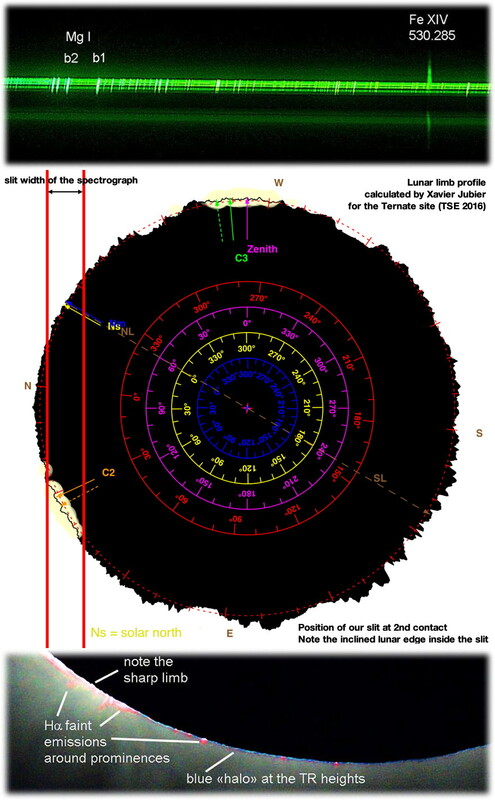 The island of Ternate was off the centerline, but still offered 2 minutes and 45 seconds of totality. Moreover the other islands in the direction of the centerline (Tidore, Mare, Moti and Makian) were easily accessible from Ternate which means reaching 3 minutes and 14 seconds of totality was achievable. 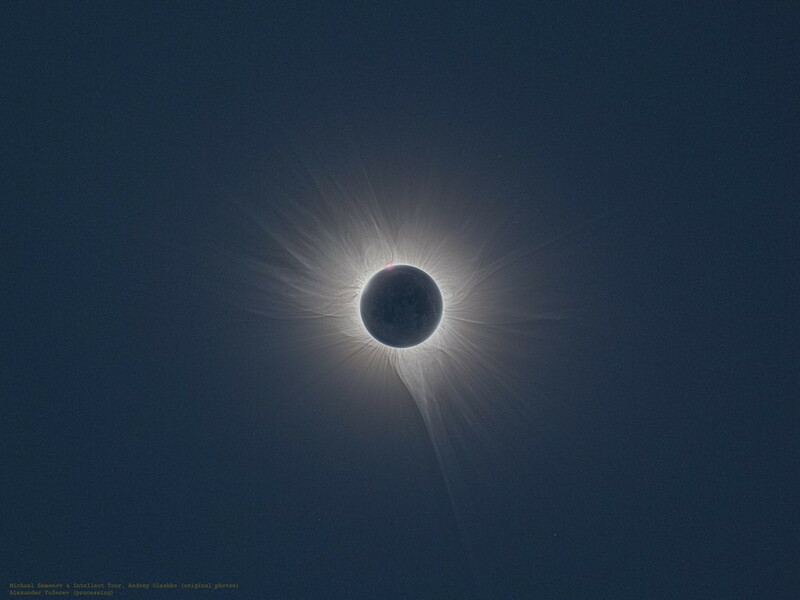 Taking a picture from the summit of the Gamalama volcano during totality provided a magnificent view of the eclipse and its surrounding landscape. The two pictures below provide a clear view of the clouds patterns over Ternate and the island to the south as well: Tidore, Mare, Moti and Makian. The weather conditions weren’t that great a few hours before the eclipse, the sky was cloudy and it rained. 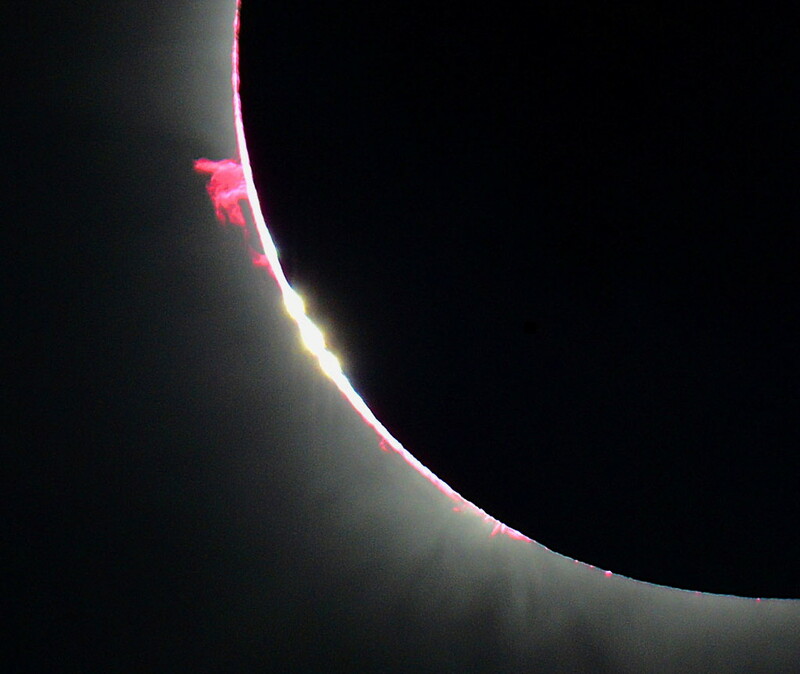 During totality the team of the Astrophysics Institute of Paris (IAP) led by Serge Koutchmy was able to collect some valuable scientific data despite the thin layer of scattered clouds. Ternate being sufficiently far away from the centerline seeing the lower layers of the chromosphere was possible. The outline of the entrance slit is shown by the two vertical red lines crossing the lunar limb profile where the second contact took place. The spectrum obtained (low First Ionisation Potential or FIP emission lines, chromospheric/TR emission lines and the green FeXIV line at 5302.85 Å) is upside down compared to the drawing such that the bright spectrum of the second contact is at the top; at the bottom you’ll find the part of the corona with the coronal continuum and the FeXIV line. 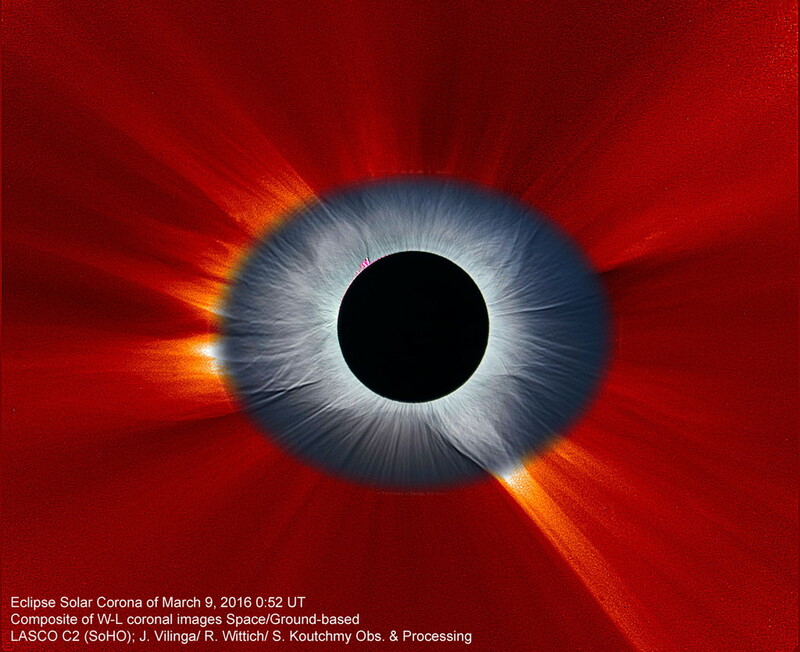 Do note, on the top part of the spectrum, the resolution near the coronal line with the F-line and its blue wing seen in emission! 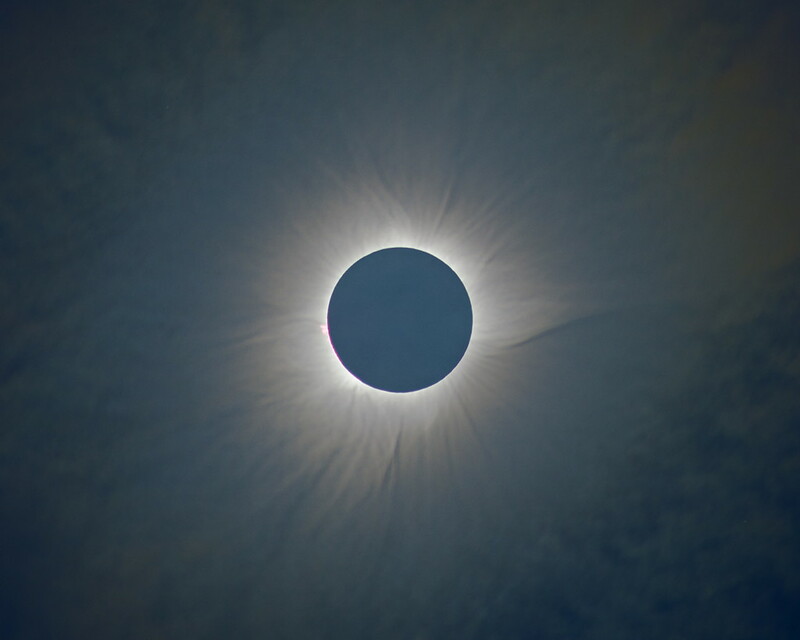 Similar "bluish halo" effect on Pulau Plun. The sky over the southern part of Tidore island was clearer than over Ternate, the next nearest island, where there was a thin layer of clouds. 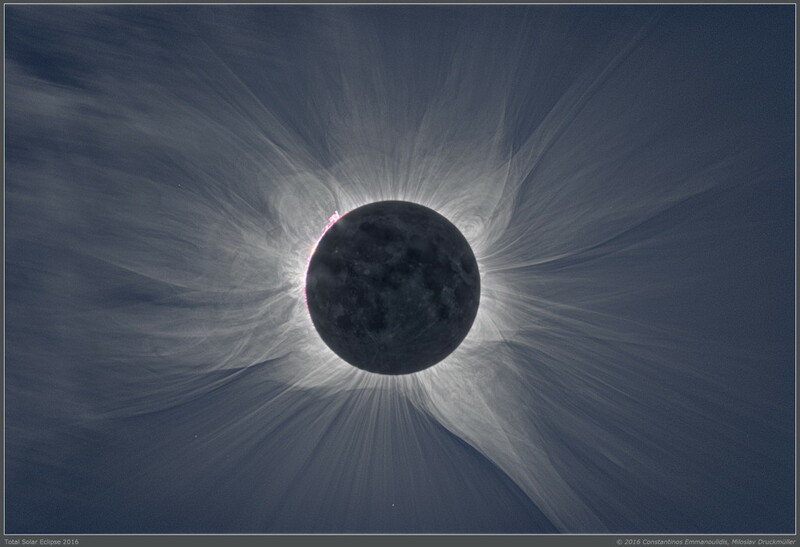 On the first picture of the solar corona, one can see the trace of thin clouds in the upper left corner.